Ron Stallworth (John David Washington, Ballers) is the Colorado Springs PD’s first African-American detective. Seeking to prove himself, Stallworth sets about taking down the Ku Klux Klan, bringing colleague Flip Zimmerman (Adam Driver, Star Wars) along for the ride. Together, Stalworth and Zimmerman infiltrate and ascend the Klan’s hierarchy, aiming to expose the organization even as it attempts to bring its hateful message to the mainstream. 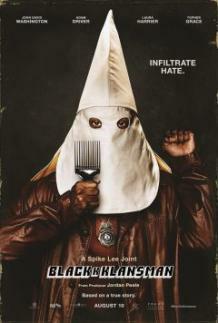 Based on Stallworth's incredible autobiography, BlackkkKlansman fiercely and fearlessly takes on the KKK in an unforgettable true story. Legendary filmmaker Spike Lee (Do The Right Thing, Malcolm X) brings Stallworth’s story to life with all his trademark style, wit, and fire, alongside the producing team behind 2017’s smash-hit Get Out.